Linzer Squares have two delicious layers of rich and buttery, nut flavored pastry sandwiched together with preserves. What makes these squares so beautiful is the lattice design of the top crust which allows you to see the ruby red raspberry preserves underneath. I love the earthy flavor of the nut pastry which includes ground nuts (almonds and/or hazelnuts), ground cinnamon, cloves and nutmeg. The pastry also includes a little cocoa powder which stains the pastry a lovely golden brown. A Linzer Torte looks Old World to me and, in fact, the Linzer Torte comes from Linz, Austria. Rick Rodgers tells us in 'Kaffeehaus' that printed recipes for this torte started to appear in the early 1700s. As far as recipes go, this one has definitely stood the test of time as it is still made with ground almonds, sugar, butter, flour, and egg yolks. One change that has come about, is the use of ground hazelnuts which I think only improves the flavor of the already delicious crust. The other change is what preserves are used to fill a Linzertorte. For while tradition tells us to use black currant, in North America we like to use raspberry preserves although apricot and cranberry do make the occasional appearance. I started making this dessert in bar form when I wanted something casual to take to a potluck supper. I adapted this recipe from Beatrice Ojakangas' "The Great Holiday Baking Book" and it is wonderful. This recipe is a little different from the Linzer Torte recipe on the site in that it has a little cocoa powder added to the dough. While using just 1 tablespoon may only add a touch of flavor, what it does do is turn the dough a pretty dark brown color which complements the dark red color of the raspberry preserves. The one thing I have found with Linzer Squares, as well as with the Linzer Torte, is that these desserts need to be made at least a day or two before serving so their flavors have time to soften and mingle. 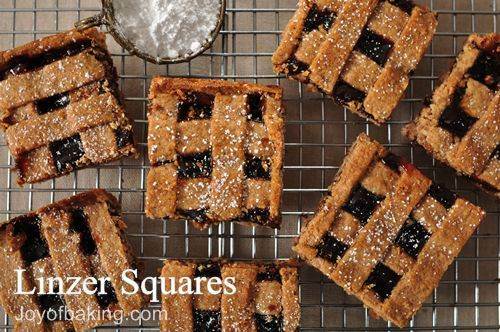 Linzer Squares: In a separate bowl, whisk together the flour, cocoa powder, spices, and salt. In the bowl of your electric mixer, or with a hand mixer, cream the butter and sugar until smooth and creamy. Add the egg and beat until light and fluffy. Stir in the ground nuts and flour mixture. Cover with plastic wrap and place the dough in the refrigerator for about one hour. Preheat the oven to 350 degrees F (177 degrees C) and place oven rack in the center of the oven. Lightly butter, or spray with a non-stick vegetable spray, a 9 inch (23 cm) square baking pan. Take the dough from the refrigerator and remove one-third of the dough and place it back into the refrigerator. Place the remaining two-thirds of the dough between two sheets of plastic wrap or parchment paper and roll the dough into a 10 inch (25 cm) square. Remove the top sheet of plastic wrap and place the square of dough into the prepared baking pan, plastic wrap side up. Pull off the second sheet of plastic wrap and, with your fingers, press the dough onto the bottom and 1/2 inch (1 1/4 cm) up the sides of the pan. Spread the raspberry jam evenly over the dough. Remove the remaining dough from the refrigerator and place between two sheets of plastic wrap or parchment paper. Roll the dough into slightly larger than a 9 inch (23 cm) square. With a pastry cutter or pizza wheel, cut the square into 1/2 inch (1 1/4 cm) strips. Lay half the strips over the jam, spacing evenly over the squares. Lay the remaining strips crosswise over the first layer of strips and press the ends into the edges of the bottom crust. (Note: If you find the strips of dough too soft, place the strips on a baking sheet and freeze for about 10 minutes.) Do not worry if the pastry tears, just press the pieces back together. Bake the squares for about 30 - 40 minutes or until the pastry starts to brown and the raspberry preserves are starting to bubble. Place on a wire rack to cool completely. Cut into 2 inch (5 cm) squares. It is best to store these squares a day or two before serving. Just before serving, the squares can be dusted with confectioners (powdered or icing) sugar. These squares can be frozen. Makes about 16 - 2 inch ( 5 cm) squares.